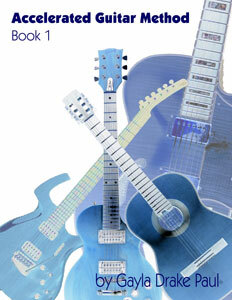 Gayla is excited to announce the publication of her new guitar book, The Accelerated Guitar Method: Book 1. The Accelerated Guitar Method is a new approach combining some of the most powerful, time-honored oral tradition techniques with the discipline of music theory. By the end of 12 weeks, know numerous chord shapes and have a guitar-based understanding of key centers and chord theory; read music, guitar tablature and fretboard diagrams; pick up any song book and play; know how to tune and care for guitars and prevent injuries to hands and wrists. Practice time required: 20-30 minutes/day. Order from CDBaby. We encourage you to visit Gayla's Favorite Links page while you are here - the artists listed there are friends and associates, and we've also linked you to the manufacturers of the gear Gayla uses and some of the organizations she's associated with. If you're interested in hiring Gayla, either on her own or with Eric Douglas, or if you would like to attend one of her songwriting workshops, guitar clinics, guitar lessons, you can check that out under Performance and Consulting Services where they are described in detail. If there's cash burning a hole in your pocket, clicking on CDBaby will take you straight to Gayla's catalog. The Lyric Archive on this site has been quoted extensively all over the Web in blogs and other places where people meet informally - if you're going to use a quote, please let us know. You don't need our permission but we enjoy knowing where her words end up! If you want to quote her lyrics in a book or magazine, or in a script for film, radio or TV, we will happily work with you to arrange a fair licensing agreement. Special thanks as always to Webmaster RJ Thorpe, who does fabulous sculpture and other wondrous works of art when he's not creating Web sites for other creative types. Thanks again for your visit and we hope to see you back again soon!